Although this website has the byline “Russian chess news and interviews in English” that’s only its main focus, and the eagle-eyed will have spotted articles that clearly don’t fit! I live in Poland, and was recently delighted to come across the chess magazine “Mat” (mate), “a grandmaster magazine for all”. Brightly and professionally produced, it boasts an impressive staff, with current Polish Champion GM Mateusz Bartel editor-in-chief, IM Stanisław Zawadzki and GM Grzegorz Gajewski deputy editors, and regular contributors including GMs Wojtaszek and Bartosz Soćko. The latest issue includes the long interview translated below. Wojtaszek – quick pronuciation guide: Voy-tash-ek (rhyming with boy-cash-[d]eck) – has now been Anand’s second in both Bonn and Sofia, and as he says in the interview, he’s hoping to push for 2700. Today he has a chance in the tournament in Pamplona, where he has the white pieces against the returning Alexander Morozevich. The games don’t seem to be available live, but you can find information on the tournament at TWIC. The photos of Wojtaszek and Morozevich from the tournament were taken from this Spanish blog. Congratulations! How did you feel after the final game? Thanks! The joy we felt is hard to express in words. All those long months of preparation and sleepless nights finally bore fruit. It’s worth training hard for such moments. How did you get Anand prepared? To what degree was it about openings, and to what degree about the middlegame and endgame? Did you devote a lot of time to analysing Topalov’s playing style, looking for weaknesses? How much of all of this was “computerised”? Was the equipment you were operating far removed from the standard equipment a chess player uses? What did the help of Kasparov, Carlsen, Kramnik and Giri actually consist of? Was it really significant? It’s hard to avoid the impression that publishing those revelations was more about building an image – I (Anand) was supported by the whole world of chess, while Topalov was only supported by a supercomputer and those he paid. What was your reception like on “enemy” territory. The hotel, the conditions etc. There was no lack of scandals in previous Topalov matches, while this time round we didn’t hear about any clashes. Perhaps something actually did happen, but you simply didn’t want to broadcast it? It always works both ways – “the walls help” [this mainly Russian saying is variously translated, e.g. as “A man’s home is his castle”] but it also puts greater pressure on the home player. We couldn’t really complain as it would be pretty hard to blame the Bulgarians for the volcano erupting in Iceland, though if that was “their doing”, then it was a brilliant move ;-) Seriously, I think the match passed without scandals because there were no grounds for them. The location of the match had long been known and we were suitably prepared. The hotel had previously been checked by Aruna, so there were no reasons to worry. The only friction was at the end of game 3, though in the end that didn’t have any significant consequences. Exactly. What was the “Sofia Rules” incident in game 3 all about? Was it a demonstration of the Bulgarian’s views? After all such matters are previously agreed upon in the match regulations. The opening of the match wasn’t a great success for you. Anand forgot his analysis and was simply wiped off the chessboard. In the second game Vishy again didn’t impress in the opening. Although you didn’t say it directly, everything points to the fact that he forgot his analysis again. What could be considered an accident in the first game was already becoming something of a rule. What mistakes were made in preparation? Was there too much to “cram”, or was there perhaps too little “cramming”? Vishy didn’t want to use it as an explanation, but we can no doubt be excused a little by the whole turmoil connected to the journey. We lost 2-3 days that would no doubt have been devoted to memorising variations. On the other hand, at the start of the match there are so many that unfortunately accidents sometimes occur… Luckily for us it all passed off without any significant consequences. After two games it was level again. Despite the opening setback, Anand won the second game displaying good, confident play. While Topalov’s performance that day was very poor, which – taking into account his previous matches – was nothing new, it seems? Yes, after that game we already knew that everything was ok with Vishy’s form. Topalov didn’t play so well, as he also didn’t in previous matches and tournaments, but how is it that with such “weak” play he crossed 2800 and became no. 1? In my opinion he makes mistakes, but at the same time exerts such great pressure on his rivals, playing such non-standard chess, that they make even more. Our whole philosophy was therefore based around neutralising that pressure, which we managed to do. Both the choice of the Slav and the Catalan could be considered copying Kramnik’s ideas from his match with Topalov in Elista in 2006. Did Kramnik recommend that repertoire to you, or did you yourselves realise that it was worth using it once more against the Bulgarian? The decision to use those openings was taken right at the start of our preparations. Topalov has never obtained good results in the Catalan, just as he hasn’t in the “Elista ending”. The character of the positions suited us. It was only during the match that Kramnik helped us – his knowledge in those opening is impressive and was extremely useful. In the sixth and seventh games Anand didn’t exploit his chances. The eighth game was the first weak one played by the Indian. What was the cause of that low in the middle of the match? Was it just a matter of tiredness? I don’t think that tiredness played a great role in his weaker form that day. Topalov began to grasp the initiative, because he was beginning to apply pressure in the openings. In games 7 and 8 Vishy was surprised and finally committed a serious blunder in the endgame. Moreover, it seems to me that you can’t play all the games at a very high level under such stress, making moments of weakness inevitable. That was probably the most dramatic game of the match, and our nerves were shattered from watching the continual twists and turns of the action on-line. The position was won, but it wasn’t all that simple. Of course, the computers show +5 and even more, but the moves weren’t as obvious as it would seem from the evaluation. …In spite of Topalov having had far greater chances to win. Both endgames were much better for him and he could have turned at least one of them into a full point, which would have been very hard to make up. After Vishy defended those positions we felt much calmer. 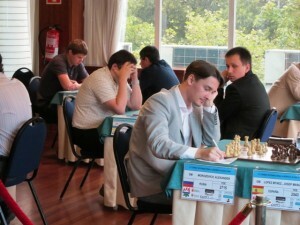 The deciding encounter involved very precise preparation based on the games of Mirosław Grabarczyk. Did you make contact with the Polish grandmaster before the game? With all due respect it wasn’t necessary. You know, after switching on the computer everything is clear and his moves turn out to have been terrible, but I don’t know if everything was so clear at the board. That’s exactly his style. For example in Linares, in the game with Grischuk, he made a few objectively poor moves which complicated the position so much that the Russian blundered a couple of times and lost. Topalov took a risk – it was clear he was already tired and very nervous and didn’t want to play tiebreaks. There was a similar situation in the match with Kamsky – in the last game Topalov also sharpened the position so much that Kamsky lost his way, in spite of the fact that objectively he could have won. Therefore it’s hard to unequivocally assess that decision, though of course in hindsight it’s clear that the risk didn’t pay off. Summing up the whole match – Veselin Topalov, with a few exceptions, played really badly. Vishy Anand, in turn, played well, but he was very inefficient, and also had opening setbacks in the first two games. With both – great, of course – players in such form, I had the impression that Magnus Carlsen wouldn’t have had any great problems against either of them. What’s your opinion? World Championship matches have always been played at a level lower that you’d expect given the ability of the players. Stress, tiredness – all of that makes itself known. Despite that the level of the match was incomparably higher than e.g. 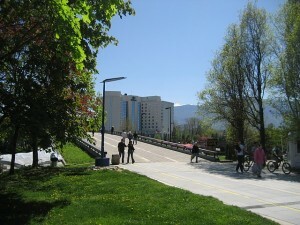 Topalov-Kramnik, or Topalov-Kamsky. There are also the specifics of a match, twelve games against the same opponent. Magnus Carlsen is a great player, but nevertheless I think he still lacks a little experience and needs to get used to matches. However, an Anand-Carlsen match would, no doubt, be an interesting spectacle and another great challenge for us. How much did you sleep on average during the match? It depended on the quality of our preparation for the next game. Before game 5, not at all. On the other hand we tried to sleep a little more before rest days in order to have more energy to work later into the night before the game. Despite what you’d think, the continual interruption of our sleep patterns wasn’t so tiring – during the match we simply didn’t think about it. How many coffees a day did you have on average? I heard that you had your own espresso machine? An indispensable item for every second? Who do you get on best with in Anand’s team? It’s hard to mention one person, as we all get along great. Rustam, Peter and Surya are excellent chess players, but above all great people. It’s amazing how much that helps in our work. Since you started to work with the World Champion you’ve made clear progress. Today you’ve got the highest rating in your career (2663) and besides your rivals almost everyone considers you the best chess player in Poland. What are you next sporting goals? It’s clear that this cooperation has had an enormous influence on my development. I’ve seen how the best train, and how they conduct themselves during tournaments and training sessions. Simply the fact that I’ve been noticed and been in the World Champion’s team twice already gives me a boost. No doubt it also gave me faith in my own ability and motivated me to work even harder in the future. The main goal, helping Vishy to defend his title, has been fulfilled. It’s hard to point to one concrete goal now. Instead I’ll just try to play as well as I can in the coming tournaments and see what comes of that. Of course I’m quietly counting on managing to reach 2700 as soon as possible, though that isn’t going to be easy. And what’s your situation in the Polish team like? There’s no secret that nothing’s changed – some are playing, others are withdrawing (Michał Krasenkow and Tomek Markowski – ed. )… Everyone complains. I see that we’ve finally got round to less pleasant topics… Well, nothing’s changed in that regard for many years – the resources that we get for development are very small. At the European Team Championships and the Olympiad the players take part for nothing, which is inconceivable in other countries. So it’s hard to be surprised when some people withdraw from the team. As for myself, up until now I’ve been so busy with preparations and the match itself that I haven’t taken any decisions – either about withdrawing from the squad or about playing at the Olympiad. Darek Świercz had a match with Movsesian, Mateusz Bartel had one with Malakhov. And you? After all you’re still young, and the 2700 barrier, unachievable for the majority of Polish chess players, is an entirely realistic goal for you. Do you feel a little undervalued by the Polish Chess Federation (PCF)? Darek’s currently the most talented Polish junior and has great potential. While Mateusz is the Polish Champion, so it’s hard to deny them the right to such matches. You know, in my case I never obtained any great support from the PCF, so the current situation is nothing new to me. It’s hard to say why that is, you’d really have to ask the federation leadership. No doubt it’s a bit strange that as the number one on the ranking list and a second for the World Champion I don’t get support from the federation, but as I said before – it’s nothing new to me and I’ve already got used to it. Since the beginning of my chess career I’ve been helped by my parents, and financially supported by my club, MTS Kwidzyn and the town authorities. They’re the ones who’ve given me the greatest support, and I’d like to take this occasion to thank them for it. And thank you for the conversation. Note: Wojtaszek also annotated many of the games from the Sofia match for the magazine. I hope to put up some highlights soon! "One of those things that distinguish us from the Neanderthals"
Kramnik helped DURING the match? Isn’t that unethical if not cheating? He wasn’t a part of the designated team of assistants for Anand. Just saying thanks for your translation site. I visit it often like many others. ‘Blue Gene’ wasn’t a part of the designated team either ! Topa fans just need to get used to the fact that their man lost, Period ! 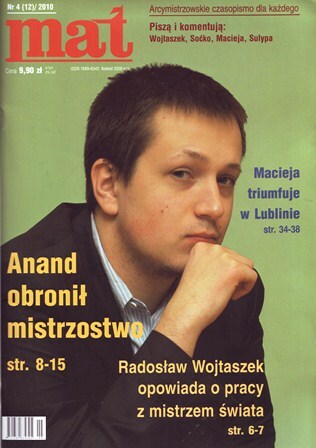 I am NOT a Topalov fan and I’m quite glad that he lost and that Anand won. But it seems to me that it’s unsportsmanlike to offer help during the match unless you are a formal part of the team. I forgot to give a link to the website, though it’s only for Polish readers: http://www.czasopismo-mat.pl/news.php Maybe you can get hold of it? I hope the “Szachy” turn up! Great to hear something from Wojtaszek! Thank you for the translation! I thought the Polish magazine’s website was mainly about letting you subscribe, but they’ve got a story on Wojtaszek’s win against Morozevich. Polish: http://czasopismo-mat.pl/news.php?readmore=603 With Google translate: http://tinyurl.com/2wef5pl (unfortunately that doesn’t translate the annotations to the game itself, but you can still play through it, or for the very keen you can copy and paste the annotations into Google Translate) – it started off with castling on opposite sides and looked set to be an attacking game until Morozevich allowed a queen exchange and Wojtaszek gradually won positionally (though not without Morozevich creating some strong counterplay at one point). After 10…Bxe2: “On 10…Bh5 11. Nf4 Bg6 I was planning to play 12. b4 and start a classic minority attack”. In chess or any other sports: Is there a – written or unwritten – rule that teams have to be announced beforehand, let alone that they have to be approved by the other team? Anand and Kramnik talked over the phone, using Skype. Among (possibly) other things they talked about chess. The only solution would be to deprive him, but then indeed also Topalov of phone and Internet connections to the outside world during the match!? Finally, huge government support for Topalov – putting a supercomputer at his disposal – also wasn’t announced beforehand and seems at least as unethical. Regardless of my opinion about the players, I am pleased that the “human cluster” prevailed in the end. ‘Actually I also received help during the match by grandmasters whose names I will not mention, as I plan to work with them in the future in secret. Clearly, they wanted me to win, so I do not complain about luck of supporters’. So Topalov can get advice from grandmasters and apparently its ok but if Anand gets advice ‘during’ the match its unethical. You guys should grow up…..Seriously ! Fressinet also won so they’re joint top before they meet next round. Both must have a tournament performance so far in the 2900s. Not quite … : TPR 2827 for Wojtaszek, 2802 for Fressinet – the overall field isn’t _that_ strong … . I wondered who’d spot the deliberate mistake :) Round 7 was good for Wojtaszek again. He drew with black against the co-leader, while the other games were also drawn – so Wojtaszek and Fressinet are still a point clear of Morozevich & others, with two rounds to go. And he won in round 8 – you can see the game here (scroll down a little): http://www.pzszach.org.pl/index.php?idm2=39&idn=914 The last move is amusing! Fressinet drew so Wojtaszek leads by half a point going into the last round, though that’s a potentially tough encounter with the unbeaten Russian Zvjaginsev – who could catch up if he won. Fressinet plays Morozevich, who lost today. Final update: Wojtaszek drew and Fressinet won, so they both finished on 6.5/9, but Wojtaszek took first place with a better tie-break. Congratulations! The Polish chess magazine say that the result, and his other performances since the match in Sofia, mean his “live” rating has increased by 30 points to 2693. He’s also playing in the Spanish league, so it might still be to possible to break through the 2700 barrier before the next rating list. Very good Article.Many unknwn facts are revealed.